BEFORE: Coming from Charlie Kaufman (writer of Eternal Sunshine of the Spotless Mind) is his directorial debut, Synecdoche, New York and the penultimate film in the Philip Seymour Hoffman chain. But there was always something that had me intrigued as to where things were headed. Like Memento, you slowly understand what’s happening as the film progresses. For every question answered, ten more arise. It’s a very unrealistic film that requires a lot of suspension of disbelief, too much in some scenes, but the film is also very realistic as well. The film deals with issues of life and death, love and loss, success and failure, and it is beautifully written and organized by Kaufman. The play within a play (within more plays) setup is both the best and worst part of the film. For most of the film, this setup is successful as you see events and actions in real life being reflected in the recreated world in the Caden Cotard’s (Philip Seymour Hoffman) play. This allows for discussion and exploration about real problems and what certain things may mean. The downside is again the suspension of disbelief. At certain times, in the end particularly, where the film goes from, “Ok, I know this isn’t real but it’s still interesting so I’ll play along with it,” to “Alright, there’s no way this could ever be possible unless it was science fiction.” It never passes the point of no return where you lose all interest because of the peculiarity but it does border on that line. 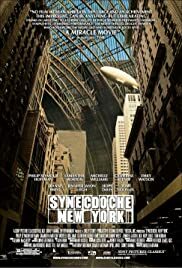 For anyone who has seen a film the Kaufman has written, such as Eternal Sunshine for the Spotless Mind or Being John Malkovich, Synecdoche, New York is a must-see. For others, while the style may seem a bit bizarre and jarring in the beginning, stick with it because it is a very entertaining and rewarding film to watch.